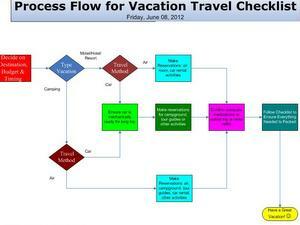 Small Business Productivity Tips - Do You Really Need to Use Checklists in Your Small Business? Have you ever wondered do you really need to use checklists in your small business? The answer to that is, it depends. Just how important is it that everything is done right? What will it cost you to miss a step or forget something? A couple decades ago, American manufacturing finally caught on that they needed to improve their quality or be left behind in the world market. The Quality Movement started producing quality standards, like ISO-900x and QSO. Part of a manufacturer achieving their quality certification involved developing written systems and checklists to make sure that everyone doing a job knew what to do on that job. While you may not think that you use checklists now, you probably do, just not in a checklist format. This is the Video that the content here comes from. How Do You Create a Checklist? Do a process flow to be sure that your steps flow naturally from one to the other. Do you really need to use checklists in your small business? If you care about your customer satisfaction, the safety of your employees, and the reputation of your company, most likely you do need to use checklists in your small business. Look around and you will find places where checklists can really improve your operations. You will be glad you did. P.S. People in my community (email list) will receive access to the Vacation Checklist shown in the video as an unadvertised bonus.